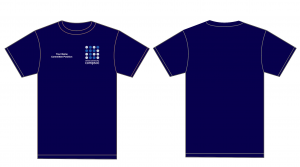 Oxford Navy t-shirt embroidered with CompSoc logo on front left chest. Optional personalisation of a name and/or committee role embroidered on front right chest. This product is currently part of a bulk order, all orders will be collated and sent directly to the organiser which means you benefit from the reduced pricing currently shown.